Do you have a child that has trouble sleeping at night or has frequent nightmares that wake them or keep them up at night? Well, you and your child are not alone and not without help! 1/4 of all children have at least one nightmare a week but interrupted sleep habits can lead to unhealthy sleep cycles in children and developmental issues. Luckily, security objects such as toys can help children sleep through the night and that is where P'Jamerz, a toy created to help children sleep by conquering their fears, comes to save the day (or night!). Each toy comes with a beautifully illustrated bed time story. The dreamworld was created by twilights, fairies whose job it is to make the dreamworld a fun place for everyone, a place where dreams come true. An evil fairy named Nightmare corrupted part of the dreamworld to induce fear into the heart of dreamers. The twilights sought to ﬁght back NightMare by giving special kids the magical power to transform and harness the power of their animal pajamas. Their goal is to help children sleep better without the need for expensive therapy or medication. We believe that the only thing needed lies right in the imagination of the child. 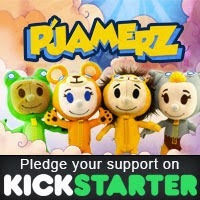 P'jamerz is launching their kickstarter campaign TODAY, Nov. 10 and it will run through Dec. 24.